Touching down for the first time in an unexplored country always holds that magic, a promise of exciting new adventures in store. PB and I chose Greece as our honeymoon destination – it is a land of Gods and stories, romance and blue skies, amazing food and incredible people. We decided on the Cyclades, not wanting to miss out on the famous honeymoon destination that is Santorini, and for the proximity to Crete, which was our final destination. We settled that we would do a maximum of 4 islands or else it would be too rushed – Naxos, Paros, Santorini and Crete. This was based on recommendations from friends, and also limitations of ferry schedules (we would have loved to go to Sifnos too, well known for its gastronomy!) If you need help choosing your Cycladic islands, here’s a pretty decent summary of them all. Paros turned out to only be an uneventful day trip, and thus is not included here. When to go: The peak summer season is in July and August, but the warm weather starts from June and goes all the way to October. We went in the final weeks of September – sure it rained for one day, but we preferred it as we avoided all the summer craziness. All of the tavernas and hotels are still operating normally (with low season rates in October), the beaches are less crowded but the water is still warm, and the ferries are regular. I’ve included our whole itinerary below, including the restaurants we went to, the hotels we stayed at, and the activities we thoroughly enjoyed. Take from this what you will, and have an amazing time! 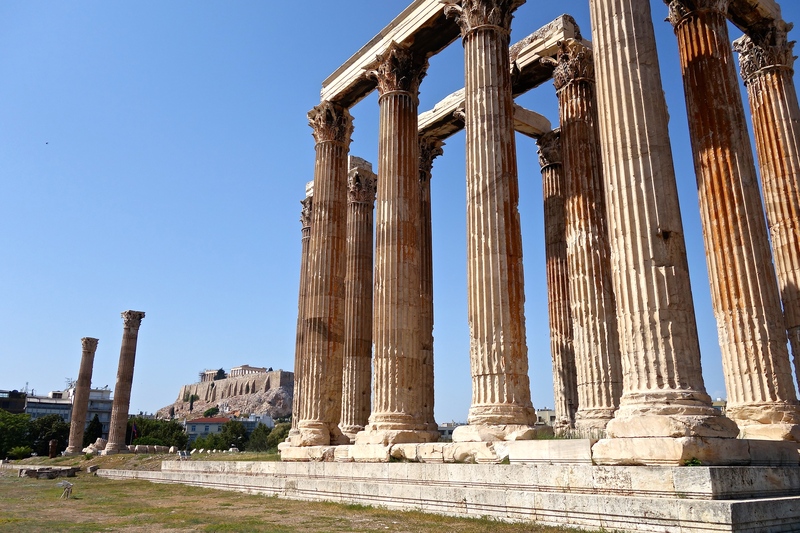 Walk: If you can stand the heat, Athens is a great city for walking as the city centre is quite a concentrated area with all the sights within general walking distance of each other. Arm yourself with a fan, a hat and sunscreen! We started off at Syntagma Square to watch the changing of the guard at the Parliament building, through the National Park under the trees for shade, a quick look at the Zappeion. Then we crossed over to the Arc of Hadrien and the impressive stone pillars of Olympieion, which loom over you like tall ghosts of history past. The Panathenaic Stadium is well worth a visit. Walk (or run) on the track where the first Olympic greats won their olive leaf crowns, and check out the small museum which displays the torches from some of the more recent Olympic Games. From here you can head to Plaka, a collection of small streets, quiet alleyways and bougainvillea-covered staircases, where cafés are filled with young beautiful people and there are some cute shops as well. Stop by Thyreos Vassiliki near the Acropolis Museum, to see some interesting Greek jewellery (slash art) – the prices are a bit prohibitive for holiday spending, but it’s still beautiful to behold. I eyed a pair of earrings there that were a bit more than I wanted to spend, and thought I might find something similar later in the trip, but I didn’t and regretted not getting them. 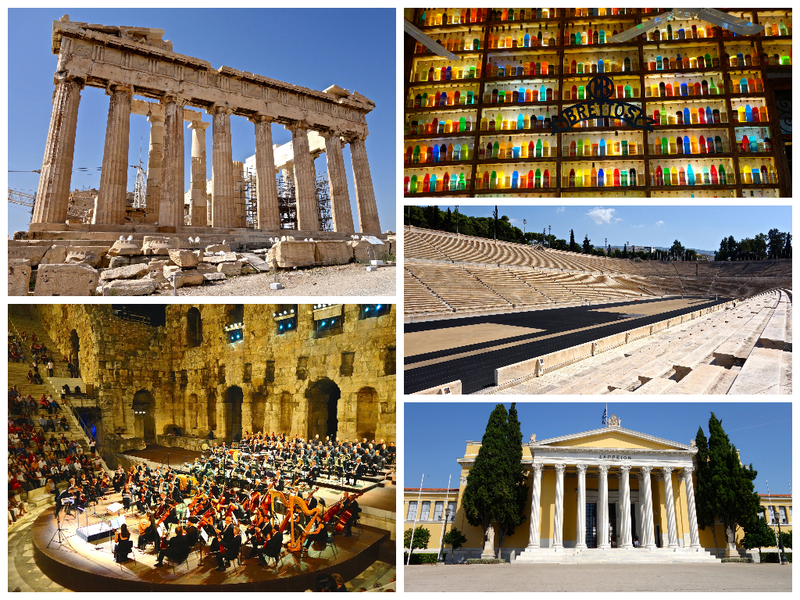 Take in some culture: It’s worth contacting your hotel concierge in advance to see if there is anything special going on whilst youre there, you never know what might come out of it – there is no Time Out Athens or any all-inclusive Athens online guide that I could find. Our highlight was a one-night-only charity tribute to Maria Callas at the Odeon of Herodes Atticus, the outdoor stone theatre built in 161 AD at the foot of the Acropolis – it was the most spectacular evening! Check out the National Opera website for events around Greece, or the website for the Athens Festival, which reportedly runs from May-October. There’s also a great website called Eventful which seems to list every other event apart from opera. Eat: One thing’s for sure, you will never eat so much Greek Salad as you will in Greece! 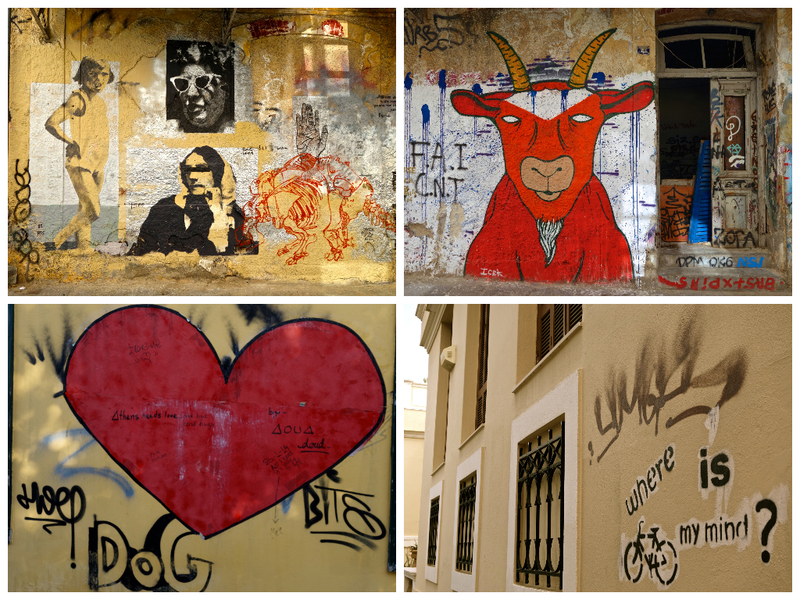 We didn’t have that much time in Athens to really explore the food scene. The GB Roof Garden Restaurant offers famously great views of the Acropolis, and whilst it tastes just fine, the food is not inspiring. Our favorite restaurant by far was one that we stumbled on by accident. 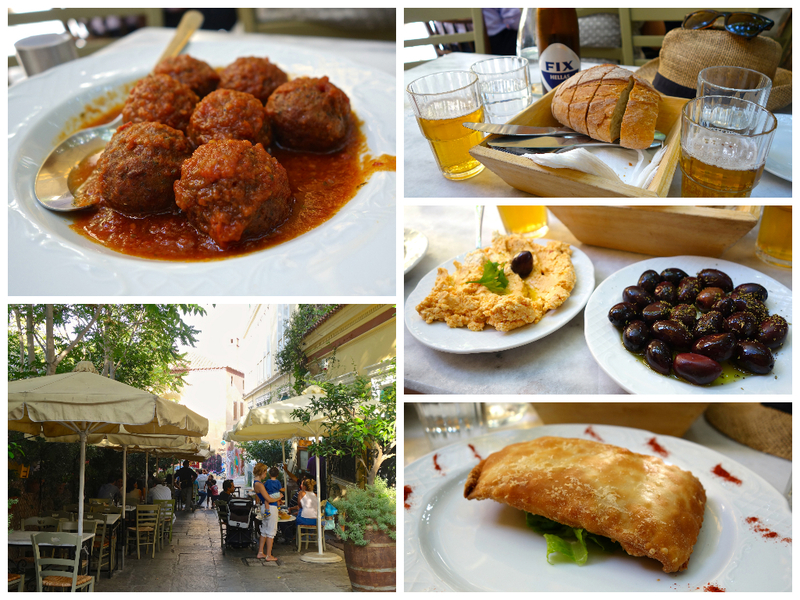 We saw several Greek families enjoying an alfresco lunch at To Kafeneio as we wandered the streets of Plaka, and thought that was a good sign. Their signature meatballs with THE sauce (yes, it was in caps on the menu) were RIDICULOUSLY good. A decent restaurant near Syntagma Square is O Tzitzikas Ke O Mermigkas (reserve a table here), a mezedopolio (think Greek tapas) that is popular with locals and tourists. Go ride a bike: If you only have a short amount of time, it’s really the best way to get the most out of it whilst getting some exercise, and if you’re lucky you’ll meet some interesting people too. We booked a 2 hour tour with Athens By Bike – our guide was Kostas, a history buff, sports enthusiast and general all around great guy. He told us a bit about the sites, tested our Greek trivia knowledge, and told us about his favorite beach in Naxos that we had to visit – all in all, a very fun morning!